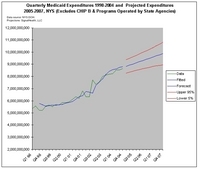 healthsignals new york: Hope for slower Medicaid growth? Did anyone else familiar with the MMA / Dual Eligibles Pharmacy issue notice the similarity of the NYS chart and the MMA 'clawback' formula ? Looks like NYS just adopted the clawback methodology and applied it to the counties as did CMS to the states. And now the states are sending checks to the Feds for the first time.